My problem situates itself in a move from Chicago to Denver. Just as I was contemplating buying a 13 year old 911 Targa for around $21,000 to have some fun with on the Illinois back roads, up comes a job offer for the mountains west of Denver. For those familiar with the area, this is Golden, Hwy 6 going west, way up going above 9,000 ft. I will be doing physical therapy visits at patients' houses. While the Porsche would be awesome in the summer, reality tells me I'll be looking at buying a used 4x4 instead. I thought about a sedan style 4x4 (Subaru, etc), but I could potentially be facing a foot of snow at times, going up unplowed driveways. So I don't want something sitting too low, yet it must have some handling to make it fun. My wife drives a Honda CRV and that appeals to me like a sack of potatoes (and so does a Forrester, a Rav 4). There has to be something out there that speaks to the imagination, but still checks the boxes for winter, mountain driving. Budget is $25,000, but preferably a bit under. Thanks a lot, guys. 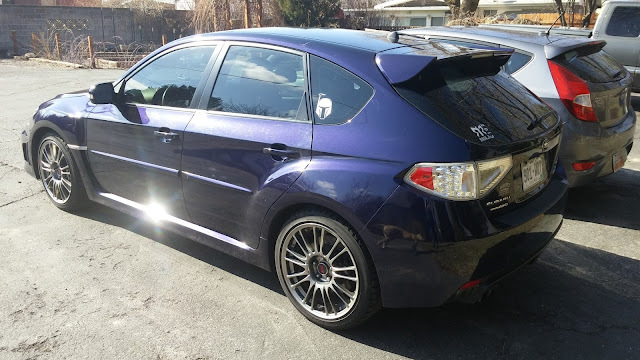 DT E-i-C Vince: I know it is a bit cliché to buy a Subaru when you move to Colorado, but for my money you could do a lot worse. The jelly bean Impreza STI (2008-2011) is a good choice at $25k and given the fact that the earlier (04-07) STI have been very flat in value around $15-20k for the past 5 years (or so), I doubt you will lose much value in a few years of jellySTI ownership. Finding a stock STI is the real trick, so here's a 2011 Subaru Impreza WRX STI with 41k miles on the odometer offered for $28,000 asking on NASIOC forums, but you could probably haggle down to your budget. 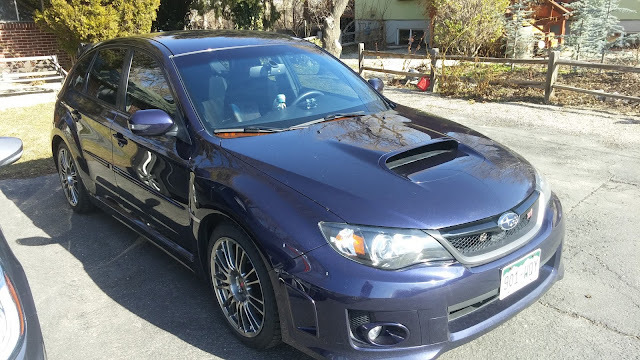 However, if you want an 04-05 or 06-07 STI, you can get a nice car for less than $20k and they are a blast to drive -- no they don't handle like an M3, but are just as fast if you understand how to drive one. However, you will need to stock up on flat brim hats, Monster energy drinks, tires and full synthetic oil. The powertrain is glorious (that's where Subaru put all the development money) suspension is pretty brutal, but ride height is decent and overhangs short, but the overall build quality (paint, interior quality) is standard economy car stuff...if you are turned off by hard plastics and cheap painted chrome you would be better served by an '04 or '08 VW R32. Neither of these cars have particularly good ride height for unplowed snowy roads...but for a few hundred bucks you could add a lift kit. What do you guys think? What should Tim drive? A Volvo c30 might be nice too, but smaller, maybe too small if you have gear to haul. I was thinking Porsche 911 C4 , but then I saw the foot of snow travel and scratched that. To deal with the snow and still have some fun driving, I'd probably get a CX-5 with a manual . I was at work (classic car shop) years ago, middle of a blizzard probably 10 inches of snow on the ground and plows arent keeping up. Suddenly heard a beep at the back door and theres a fairly new 911. We hadnt plowed at all because we never dreamed anyone would show up that day. The snow was up to the bottom of his door. That guy was my hero. Jeep Wrangler. Not only will it have no problem with unplowed driveways, it makes finding the driveway optional. Not an appliance like a crossover either. Although if a Wrangler is not interesting enough, may I suggest one of these? I moved to the Golden, CO area two years ago in May. A couple of stark differences here from Chicago or the Northeast where I'm from... Snow removal here is not nearly as rigorous or thorough as you're probably used to. Most likely because the snow doesn't stick around very long due to the sun and temp variations. Last weekend I got 2 feet by 8am at my house and the unplowed roads were dry by evening. Secondary and tertiary roads aren't plowed unless snowfall is over a certain amount. In two winters I've only seen my neighborhood get plowed once. We had a major blizzard this winter and there were reports of 1-2 feet of snow on the roadway in the mountains. My coworker has a lifted jeep was able to get home from skiing but almost anything car height was stuck. If you need to be out driving in the snow for appointments, or plan on traveling to the mountains for skiing, I would highly recommend dedicated snow tires in addition to AWD. Black ice is common here as well, and again the road treatment is not nearly as thorough or proactive as what you're probably used to. Once the sun goes down road temps drop and any melt or liquid freezes up quickly. My neighbor has a new GMC 2500 pickup with all seasons, and got stuck in his driveway in 2.5 ft of snow because the bottom layer was slush and the snow was super heavy which hung up the frame. Also, used 4x4 and AWD vehicles hold their value here pretty well, you may want to consider buying in IL to save some money. And they make this thing in an Arctic Edition and oh my goodness is it a great looking car. It is even (kinda) on your way to CO! For the sake of your soul I'm going to vote delegation. Unimog, Land cruiser, willis jeep, whaterver with a set of dedicated snow tires for the 20" and a sports/GT car for when it's not snowing. Trust me, compared to the roads in Illinois you're going to want one. On the practical side you're also halving the miles going onto each. Get a separate set of winter and summer tires and wheels and don't drive in the mountains w/out good snow tires. If ground clearance is an issue because of snow, just call it a snow day and re-schedule! I can't explain why but I've always liked the Infiniti EX35 - smallish luxury, realtively powerful, hatchback, reliable and AWD. The Audi wagon above is gorgeous. Maybe a 5 Series wagon? Also - don't buy it here, you'll pay a stiff premium for 4x4 and AWD in Colorado. Welcome to the neighborhood (I work in Golden)! Thanks to all for the great suggestions. My current ride is a '08 Saab 93 station wagon, so the Volvo and the Audi were on my mind. But looking at some of the other options (no, not the Unimog, but thanks for putting it out there)like the Wrangler don't seem too far-fetched. I definitely plan on an extra set of wheels with winter tires. Bubba, I saw the price on the Audi wagon, and in Chicago it would cost about 5 grand less for one with similar miles/options. But in Boulder I can probably get more money for my Saab as well, so give some, get some. Thanks MC and the others as well for the good info. As someone that has lived in Centennial, Colorado for nearly 40 years (a southeast suburb of Denver), I can say that the number of times that you truly need to clear high snow will be pretty limited, even being there in Golden and the foothills. So if you base your vehicle purchase on that need alone, you are going to end up utilizing its full capabilities maybe 10 to 30 days a year (and that’s probably a stretch). Now, that’s not to say that having AWD on a “regular” car isn’t nice more often than that, such as with an Audi (Quattro), BMW (X-Drive), Subie, etc. ; but even then, if you are comfortable driving in inclement weather, which being from Chicago I would think you would be, you’d be surprised how much you can get around in the winter in just a “regular car”. So my suggestion? Spend +/- $5k on an old pickup, Jeep, etc. with 4WD and high clearance for those few times you need it. (And if you make it a pickup, you then end up having something around for when you need to haul a pile of stuff.) Nothing fancy, but just reliable enough to start-up every time you need it. Colorado is “out west”, so there are plenty of good pickups to find. _Then_ use that remaining $20k on something that will be a lot more fun tearing up and down the mountains the other 90% of the time, say that 911 Targa you were mentioning. Or with utility of a wagon? Forester XT for the commute, rest of the monies for something fun when it's dry. I daily an N/A NA Miata year round in Colorado Springs (though it's relatively flat in town), and hoon around in a turbo NA whenever the roads are dry. You'll find a happy medium. Two vehicles is the best solution.